Over the rainbow or pie in the sky? The man behind the plan to turn a patch of Wheatfield into "The Magical Land of Oz" acknowledges he has no track record as a developer. He admits his Oz Central headquarters office is small, and that is sits at the front of a polymer resin casting plant in Henderson, Ky.
His investors know that there was a failed attempt to build an Oz theme park in Kansas. Yet Richard A. Burch has begun to convince a growing number of people that a year-round, indoor-outdoor resort based on one of the most popular stories ever told can succeed a short drive from one of the world's most popular tourist attractions. Tow years ago, Wheatfield Supervisor Timothy E. Demler wouldn't return Burch's calls. "I am a believer now," said Demler, who has spent part of the last year meeting members of the Oz creative team and investors who've told him they will help bankroll the project. Burch lives in Evansville, Ind., and is part-owner of the casting plant that houses the Oz office across the Ohio River in Henderson. He has hooked up with some of Hollywood's most experienced creative minds to work up plans for a 300-acre theme park on a vacant piece of land south of the Summit Park Mall. Last month, Burch showed off a site plan for the theme park in the offices of Savarino Construction Services Corp. in Amherst. Samuel J. Savarino, that company's president, is to be the contractor and co-developer of the massive project. Local members of the board of directors include John J. Long, former Niagara County Republican Party chairman; Frank Taibi of Lewiston, a retired heating oil and concrete magnate; Peggy Toth, owner of Advanced Animations, a film company with offices in Vermont and Michigan; and Joel T. Smith, a Hollywood producer whose last major film was "Stephen King 's Riding the Bullet." Burch has signed a purchase option to buy 527 acres of land from Forest City Enterprises of Cleveland, the former owners of Summit Park Mall. The option cost $7,500 an acre, according to Forest City chairman Sam Miller, who said he approved it about a year ago. Besides that investment of almost $4 million, Burch said he has verbal agreements to buy 22.5 acres of land from Long and 30.2 acres from Mark Haseley, owner of Haseley Construction Co. The theme park will cover a little more than half the property, and future construction of hotels and other amenities is envisioned on the remainder. To try to combat the winter weather, 80 percent of the attractions will be indoors, including "a giant water park and tropical island," Savarino said. The site plan includes rides and attractions with names like "Glinda's Castle," "Munchkin Waterworks," "Scarecrow's Maize Maze " and "Nightmare River. " The concession area will be located at "Aunt Em's Country Kitchen" or the "No Place Like Home Kitchen." The creative companies under contract to Oz Central, Thinkwell Design and Production of Burbank, Calif., and Kirk Design of Long Beach, Calif., don't want to release any details about the attractions yet. They fear that competitors in the theme park business might swipe some of the ideas. "We've completed the preliminary design phase, the `blue-sky phase ' where you sort out the big ideas," said Kelly Ryner, vice president of new business development for Thinkwell, whose staff consists almost entirely of former Universal Studios theme park designers. 'We've worked with a lot of different developers," Ryner said. "Many of them you can tell in a few minutes are not going to make it. In my heart of hearts, I actually believe (the Oz park) is going to happen. " "This is not a fly-by-night outfit," said Kathy Kirk, president of Kirk Design, whose staff consists entirely of former Walt Disney employees. "I think the chances of success are very good for this type of project," said Tom Kozlowski of Urban International New York, another former Disney theme park executive whose company completed a land planning and financial analysis of Burch's plan. That analysis projects 8,000 jobs at the theme park and resort, 10,000 construction jobs and $70 million a year in town, county, and state tax revenue. Most of that will be sales tax, Demler said. The developers want to be in one of the state's tax-advantaged Empire Zones, which would take Oz off the property tax rolls. That would require State Legislature approval, said State Sen. George D. Maziarz, R-Newfane. He said he thought the project can succeed, "if it had the proper financing." Burch said the details of the financing are confidential but emphasized that he will not ask for government cash. Demler said the town won't contribute any money, and the developers will have to pay for their own drainage district and any other necessary infrastructure improvements. Town Attorney Robert O'Toole said that includes the proposed entrance to the theme park, which is to be a short extension of the LaSalle Expressway as an overpass above Williams Road. The expressway is a key to the successful scenario of tapping into the massive tourist traffic in Niagara Falls, most of which arrives by car. A drive of about 10 minutes from the state park along the Robert Moses Parkway and the LaSalle Expressway brings you to Williams Road. Burch, 55, worked as an engineer for Johnson & Johnson until 1987, except for two years with Escalade, a firm that manufactured recreational equipment for Sears stores. In 1987, he and a partner started Northstar, a company in Evansville that manufactured pool tables. Burch split with his partner in 1994. He then started Design Cast Studios, a company in Henderson that manufactured funeral urns. 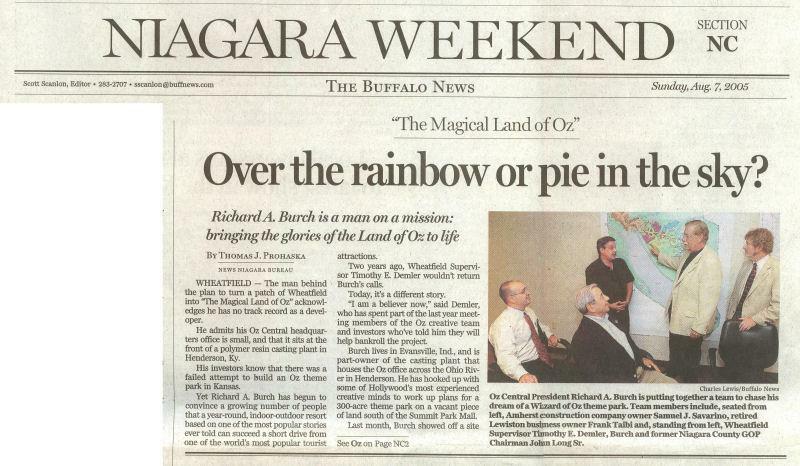 Burch said he stumbled into the Wizard of Oz business in 1997, when he met the great-grandson of L. Frank Baum, the author of 38 Oz books, at a convention in Las Vegas. A year later, he held the merchandising rights to the characters from all of Baum's books, granted by the Baum Family Trust. The project fell through in the fall of 2001, when the Johnson County (Kan.) Board of Commissioners defeated it on a 3-1 vote. A group called "Taxpayers Opposed to Oz," or TOTO, led the fight against the project. Kory told a Lawrence, Kan., newspaper he lost $2 million of his own money, while his largest investor, a Michigan technology company, lost $14 million. After the project failed, the Baum family asked Burch if he'd step in. Burch compiled a list of 10 possible sites, all in the southern United States. Niagara County entered the picture because of Tom Wahoski, a former Niagara Falls resident who was a college friend of one of the investors. He called Burch and suggested the Cataract City. "We didn't want anything to do with the Kory group or any of their product," Burch said. "I didn't even like their approach. It was heavily based on the movie, a lot of stage shows and actors." Burch said he also didn't like the Kansas location and yearned for greater control of the project. "It's close to the airport, it's close to the water, it's pretty much virgin land, no Brownfield associations," Burch said. Last October, Demler and O'Toole were flown to Hollywood for the premiere of investor Smith's Stephen King movie. "We did meet some potential investors who were just salivating," O'Toole said. `They couldn't believe there were 600 to 800 acres of open land within a 10- to 15-minute drive of the American Falls without any new roads being needed." Demler declared that the full environmental impact study on the largest project in local history would be done by the end of this year. "We know it's clean. We know it's safe," he said. Savarino was more restrained. 'There aren't any foreseeable (environmental) problems," he said. '°That said, you never know."